This is our largest wrap around hinge ! 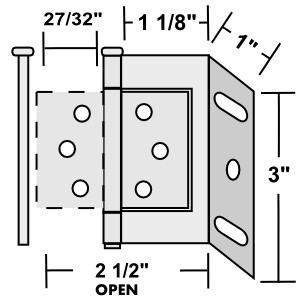 I used these hinges to replace the one that came with some shutters that I ordered. They allowed me to install the shutters within the recess of the fixed windows without adding trim pieces. As a result, I have a very clean installation. The shutters fit the space, edge-to-edge. I'm quite pleased. Also happy with the folks at Shutter Medic - nice firm to work with. I installed these hinges on some interior shutters I made. They work great.